Rendered in a wholly original voice, at once sensuous and intelligent, Called Back is a cancer critique for the 21st century. Mary Cappello wonders aloud for us what breast cancer awareness really makes us aware of, and responds as if for the first time to the deceivingly simple command: “tell me what you’re feeling.” Unable to eat on chemotherapy, Cappello feasts on the paintings of Marsden Hartley, yearns in the tradition of Dickinson and Stein, keeps company with Proust, and lets queer artists tease her back to life. Called Back looks through the lens of cancer to discover new truths about intimacy and essential solitude, eroticism, the fact of the body, and the impossibility of turning away. » Watch a video interview with Julie Bolcer, recorded in the Here! TV Studios in Manhattan. » Read Regina Marlar's interview for The Advocate and shewired.com. » Listen to an hour-long call-in radio interview with Jean Fereca, "The Language of Cancer," for Here On Earth, Wisconsin Public Radio. Jean Feraca writes: "I'm not really fond of cancer memoirs which have become so commonplace (like the diagnosis itself) that they constitute a genre of their own. But Mary Cappello's Called Back is in a class all by itself. Well, she's a writer after all, and she uses her own clear-sighted intelligence and razor-sharp sense of language to scrutinize the culture of breast cancer and to blaze right through it, port scar and all." » Read a review of Called Back by poet and memoirist Maureen Seaton. 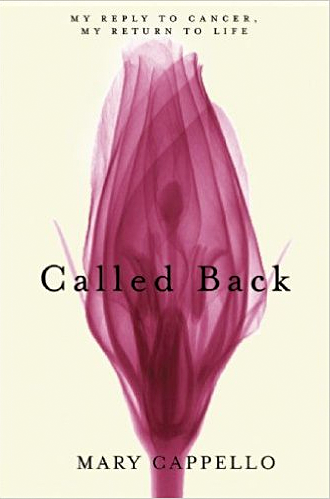 » Click here to listen to Mary Cappello read from Called Back at the Nonfiction Now conference, "Bodies. Spaces. Memories" panel, with Barrie Jean Borich, David Shields, Suzanne Paola, and Paul Lisicky. » Click here for Cappello and Pope's Practical Guide to Dealing with Chemotherapy.